San Antonio’s five Spanish missions, which include the Alamo, were being pulled from the brink of destruction at the beginning of the twentieth century just as picture postcards came into vogue. 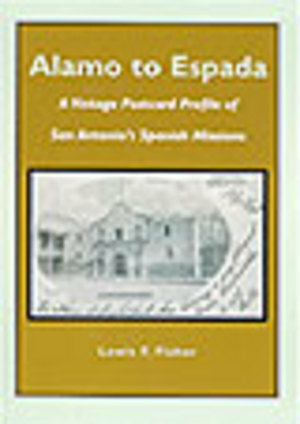 In Alamo to Espada, images are arranged to illustrate the dramatic transformations of the old mission churches and grounds. Also, a section entitled “Remember the Alamo” includes images of cards showing celebrations, advertising and other methods of patriotic Texans to preserve the memory of the shrine to Texas liberty. Another chapter, with more than two dozen illustrations, displays the missions’ architectural legacy, from landmark railroad stations to hotels to beer gardens.